Any chard – red, green, rainbow, baby – works well in this, but you can also substitute spinach. Adding potatoes picks up on the traditional Spanish omelette concept and it makes this frittata filling enough for dinner, especially paired with a hearty fall green salad. 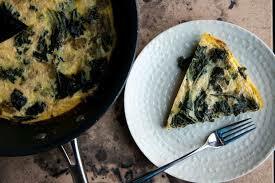 The frittata also is tasty at room temperature and makes a great appetizer. Danielle demoed this frittata at the US Botanic Garden in October and it was slurped up by a class of first-graders who were visiting from a local school, where the kids tend a community garden. The recipe was adapted from Fine Cooking. Preheat the oven to 400F. Separate the chard stems from the leaves and slice each ¼ inch thick. In a 12-inch oven-safe non-stick skillet, heat the oil over medium-high heat. Add the onions, chard stems, grated potatoes and rosemary. Cook until soft and browned in spots, about 10 minutes. Add the garlic and red pepper flakes, stir well and spread the mixture evenly in the skillet. Lightly beat the eggs in a medium bowl. Mix in the chard leaves and grated cheese and pour over the potato mixture. Transfer the skillet to the oven and bake until frittata is set, about 15 minutes. Let cool slightly before cutting and serving. This entry was posted in Brunch, Main Courses, Recipes from Danielle's pantry, Vegetarian and tagged chard, cheese, eggs, greens, potatoes. Bookmark the permalink.